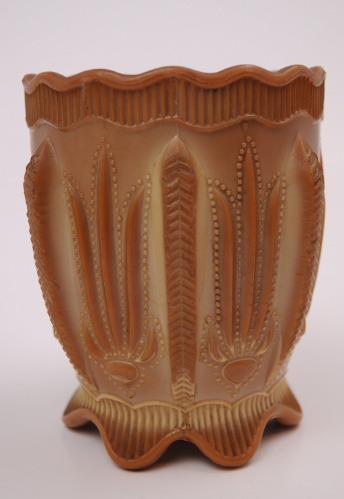 This piece was introduced by the Indiana Tumbler & Goblet Company in Greentown, Indiana in 1901 and while the pattern was manufactured through 1903, this piece was only manufactured in 1901. The company named and numbered the pattern "Paneled Agave" 375 series. But collectors began referring to it as "Cactus Leaf" around the 1930's and as a result Cactus Leaf has been it's common name ever since. This one is in superb condition with no chips, cracks, hairlines, or flaws we can see anywhere. Every tiny dot of the pattern is in perfect place. The color is nice rich chocolate glass brown with a slag swirl smooth bottom. Whether used as a spooner, fine small vase, or as a showpiece display for your collection or decor, this is a very nice find of quality slag. IMPORTANT FREE SHIPPING NOTE: This piece will ship very carefully padded, packed, double boxed and USPS Priority Mail for safe and faster delivery absolutely free to your doorstep! Our Free Shipping always includes Tracking Numbers so you may track your purchase.